With the renowned high quality of Iwata, this airbrush tanning kit is for professional mobile, home or student use. 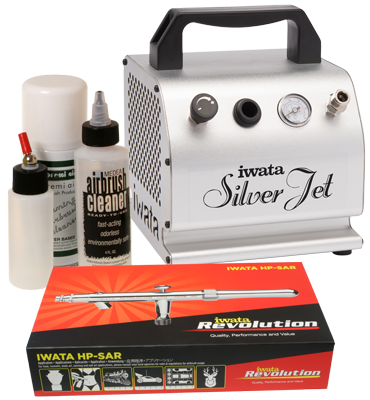 The single-action (one press for air and product) of the Iwata Revolution SAR airbrush makes this system easy to use and easy to maintain. The Iwata Silver Jet compressor is attractive, compact and lightweight - ideal for the mobile professional. This manual compressor has a pressure guage and a pressure adjustment knob. The kit comes with two bottles and two airbrush cleaners. You can use this system with any spray tanning product. 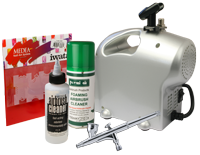 The compressor is also suitable for running an airbrush for other home beauty applications such as, nail art, body art or cosmetics. The compressor is not suitable for heavier salon use. If you need a compressor for heavier use, please click here to see all other spray tanning kits.